Welcome to Americas Best Value Inn Houston FM 1960/I-45. Houston is the fourth largest city in the United States and the largest city in the state of Texas. Houston is the home of the Texas Medical Center/ which is the world-s largest concentration of health care and research institutions. It is also home to NASA-s Johnson Space Center/ where the Mission Control Center is located. We are ideally located in northern Houston/ with easy access to the Spring Historical Museum/ Museum-Fine Arts Cypress Creek/ and the Big Zoo. Local restaurants include Monterey-s Little Mexico/ James Coney Island/ Beijing Chinese Restaurant/ and Steak and Ale Restaurant.Start your day right by picking up a free newspaper in our lobby and enjoying our free continental breakfast available from 6.00am-9.30am. Coffee is available in our lobby 24 hours/day. Free wireless high-speed Internet access is available throughout our hotel and guest rooms. Relax in our indoor pool and heated spa. Appreciate the convenience of our on-site guest laundromat. Rest easy in our spacious guest rooms with amenities including microwaves/ mini-fridges/ cable TV with HBO/ hairdryers/ and free local calls. At Americas Best Value Inn Houston FM 1960/I-45/ We-ve Got You Covered from the time you hit the road until your head hits the pillow. 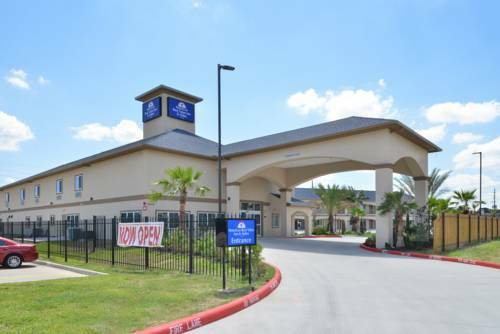 Americas Best Value Inn Houston FM 1960/I-45 is located 1/2 mile west of I-45 on FM 1960 West Road. Our address is 609 FM 1960 West/ Houston/ TX 77090.